I have finally embarked on my first machine learning MOOC / Specialization. I love Python, and this course uses Python as the language of choice. Also, the instructors assert that Python is widely used in industry, and is becoming the de facto language for data science in industry. They use IPython Notebook in their assignments and videos. The specialization offered by the University of Washington consists of 5 courses and a capstone project spread across about 8 months (September through April). The specialization’s first iteration kicked off yesterday. The first course, Machine Learning Foundations: A Case Study Approach is 6 weeks long, running from September 22 through November 9. 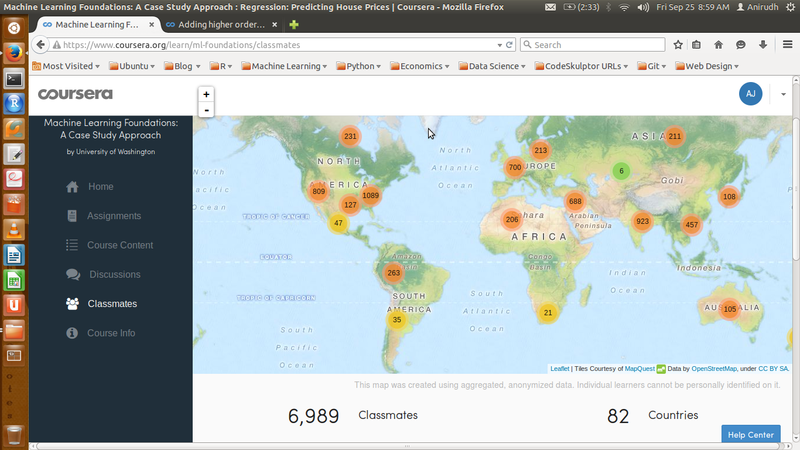 – Identify potential applications of machine learning in practice. – Describe the core differences in analyses enabled by regression, classification, and clustering. – Select the appropriate machine learning task for a potential application. – Apply regression, classification, clustering, retrieval, recommender systems, and deep learning. – Represent your data as features to serve as input to machine learning models. – Assess the model quality in terms of relevant error metrics for each task. – Utilize a dataset to fit a model to analyze new data. – Build an end-to-end application that uses machine learning at its core. – Implement these techniques in Python. I enrolled in Introduction to Computer Science and Programming Using Python with the primary objective of learning to code using Python. This course, as the name suggests, is more than just about Python. 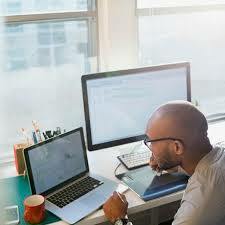 It uses Python as a tool to teach computational thinking and serves as an introduction to computer science. 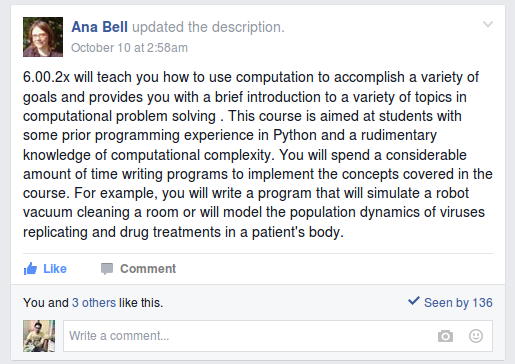 The fact that it is a course offered by MIT, makes it special. As a matter of fact, this course is aimed at students with little or no prior programming experience who feel the need to understand computational approaches to problem solving. Eric Grimson is an excellent teacher (also Chancellor of MIT) and he delves into the subject matter to a surprising amount of detail. The video lectures are based on select chapters from an excellent book by John Guttag. While the book isn’t mandatory for the course (the video lectures do a great job of explaining the material on their own), I benefited greatly from reading the textbook. 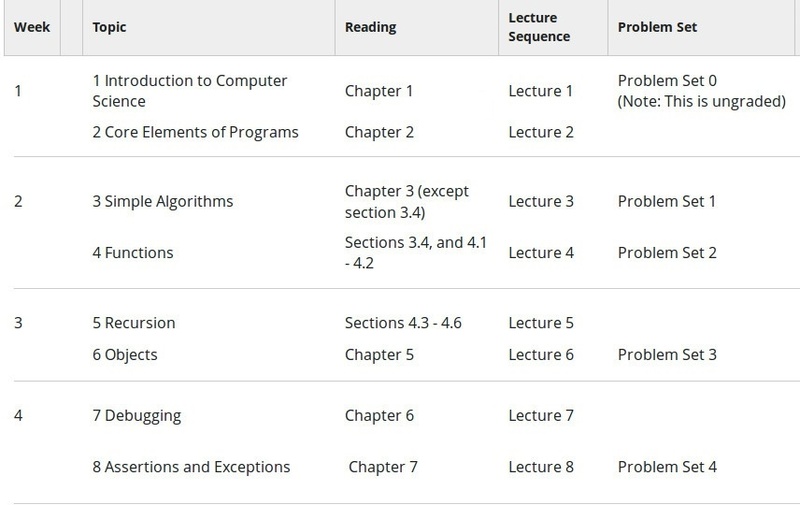 There are a couple of instances where the code isn’t presented properly in the slides (typos or indentation gone wrong when pasting code to the slides), but the correct code / study material can be found in the textbook. Also, for explanations that are more in-depth, the book comes in handy. MIT offers this course in 2 parts via edX. While 6.00.1x is is an introduction to computer science as a tool to solve real-world analytical problems, 6.00.2x is an introduction to computation in data science. For a general look and feel of the course, this OCW link may be a good starting point. It contains material including video lectures and problem sets that are closely related to 6.00.1x and 6.00.2x. Each week’s material of 6.00.1x consists of 2 topics, followed by a Problem Set. Problem Sets account for 40% of your grade. Video lectures are followed by finger exercises that can be attempted any number of times. Finger exercises account for 10% of your grade. The Quiz (kind of like a mid-term exam) and the Final Exam account for 25% each. 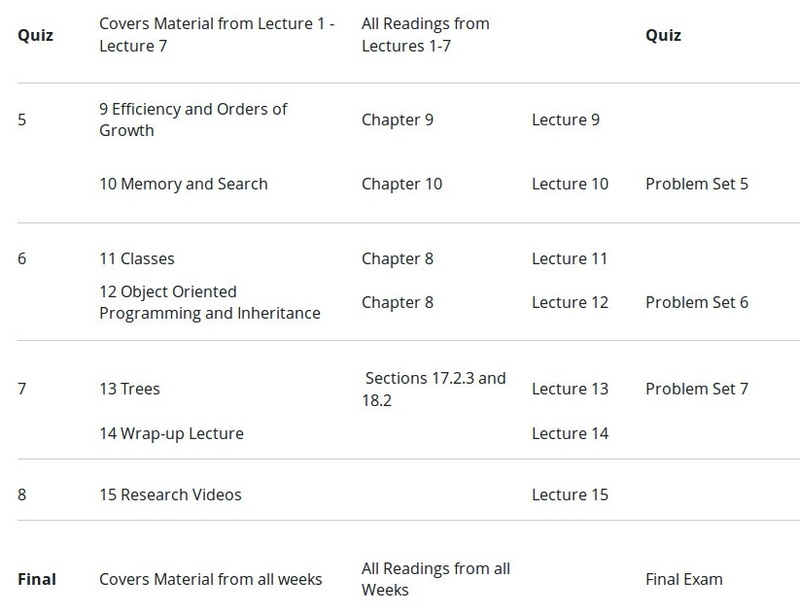 The course is of 8 weeks duration and covers the following topics (along with corresponding readings from John Guttag’s textbook). From the questions posted on forums, it was apparent that the section of this course that most people found challenging, was efficiency and orders of growth – and in particular, the Big-O asymptotic notation and problems on algorithmic complexity. Lectures on Classes, Inheritance and Object Oriented Programming (OOP) were covered really well in over 100 minutes of video time. I enjoyed the problem set that followed, requiring the student to build an Internet news filter alerting the user when it noticed a news story that matched that user’s interests. The final week had lectures on the concept of Trees, which were done hurriedly when compared to the depth of detail the instructor had earlier gone to, while explaining concepts from previous weeks. However, this material was covered quite well in Guttag’s textbook and the code for tree search algorithms was provided for perusal as part of the courseware. At the end of the course, there were some interesting add-on videos to tickle the curiosity of the learner on the applications of computation in diverse fields such as medicine, robotics, databases and 3D graphics. 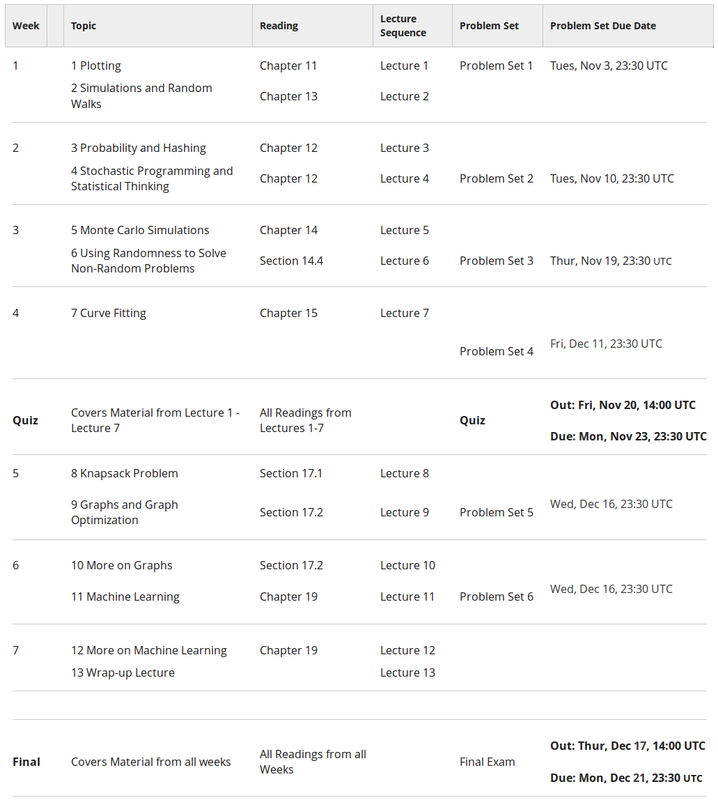 The Wiki tab for this course (in the edX platform) is laden with useful links to complement each week of lectures. I never got around to reading those, but I’m going through them now, and they’re quite interesting. It’s a section that nerds would love to skim through. I learnt a great deal from this course (scored well too) putting in close to 6-hours-a-week of study. It is being offered again on August 26, 2015. In the mean time, I’m keeping my eyes open for MIT’s data science course (6.00.2x) which is likely to be offered in October, in continuation to 6.00.1x.